For orders above SG$200, delivery will be free of charge. Overseas order will be sent via post or courier service, please ask for quote. 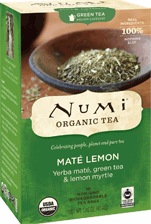 This infusion of organic South American Yerba Maté, Australian Lemon Myrtle and green tea unfolds into a lemon taste with sweet, earthy undertones. Its stimulating effect evokes a cheerful mental lucidity. For the benefit of public health awareness, should you want to use the article(s) in this site on your site, you may do so. However, the content must be copied in full, with copyright, contact, creation and back link information included without our written permission. If any other use is desired, permission in writing from Edwin is required. © Copyright 2011 Nutrimax Organic. All Rights Reserved.